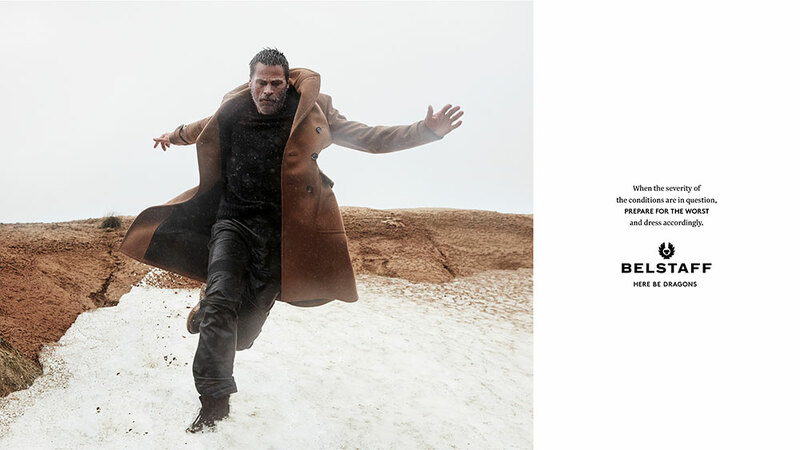 Belstaff harkens back to when people first mapped the world in its new print advertising campaign. The brand uses the phrase "Here be dragons", which once marked unexplored places as dangerous but instead inspired some adventurers to discover them. In that spirit, the campaign aims to encourage people to push boundaries. Photographer Christian Weber shot models Mark Vanderloo and Mijo Mihaljcic in rugged landscapes. The ads will run across press, outdoor, digital and in-store in the UK, Germany and Japan, as well as digital and in-store in the US. The work was created by Rick Dodds, Steve Howell and Steve Paskin at Droga5 London, which was appointed as the brand’s creative agency last year.